The Journal of Materials Science is now firmly established as the leading source of primary communication for scientists investigating the structure and properties of all engineering materials. 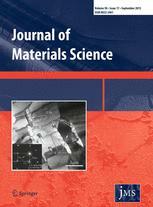 The Journal of Materials Science publishes reviews, full-length papers, and short communications recording original research results on, or techniques for studying the relationship between structure, properties, and uses of materials. The subjects are seen from international and interdisciplinary perspectives covering areas including metals, ceramics, glasses, polymers, electrical materials, composite materials, fibers, nanostructured materials, nanocomposites, and biological and biomedical materials.